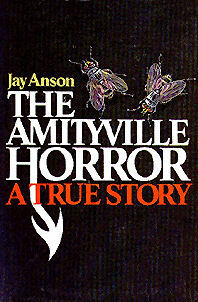 I have a love/hate relationship with Jay Anson’s The Amityville Horror. I find this novel entertaining, yet I feel like there could be more to the story. The novel was originally published as a “true story,” but most readers, and maybe even those who have never picked up this novel, know that the truth is actually fiction. If it were a true “true story,” then I don’t think I would I would feel more could be added to the story, but because it isn’t I feel it is too thin at times, for reasons I will discuss below. The characters in the novel seem, to me, like they could be genuine people, particularly the reluctance to initially believe the house is haunted, that is, of course, unless a person already holds the belief that phenomena, such as the phenomena that occurs in the novel, can happen. I think the average person may try to find rational answers, much like George Lutz at the beginning of Anson’s book. Father Mancuso is probably the character I like the most; not because he is brave, for he is not when comparing him to other priests, such as those in The Exorcist. I believe his fear, especially after he is plagued with painful blisters and a fever. He is real, and acts real, much like a typical person would who had never experienced a haunting. When I say I feel the story is thin, I mean clichéd. Nothing is new, and not even for the time the novel was written. There isn’t anything that goes beneath the surface of what people have, and had, come to expect from a haunted house story. There’s the swarms of flies, the sudden awakening from sleep at a certain time, and even a cross that is flipped upside down. Perhaps the only thing added that I feel is different, is a sour smell emanating from the cross. What I give credit for is the “true story” tag for the book. From what I can tell, this was one of the first novels to claim this in this way. By doing this, Anson created instant fear in the reader because the reader had in his or her head that this could happen at any time, with the Lutz’s being proof of that. Now, the “true story” tag is overdone, much like found footage films. Something that I find interesting, but not important to the book, is that traditionally an upside down cross is a religious symbol, that of St. Peter. In the past, and perhaps apocryphal, it was said St. Peter refused to be crucified on a cross right-side up because he felt he was unworthy of being crucified in the same manner as Jesus. The upside down cross came to be known as a symbol of humility and respect, not anti-Christian. One of the thrones for the pope bears and upside down cross. It would be interesting to research when the upside cross became anti-Christian, so to speak. Is it ironic that many people who tattoo upside down crosses as a display of (insert what they feel the cross represents to them) actually tattooed an ancient symbol for humility and respect toward Jesus?